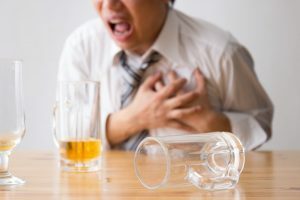 Alcohol and Heart Disease: What is the Connection? Alcohol is the most widely consumed addictive substance in the U.S. Heart disease is America’s most common cause of death. While these may seem like unrelated facts, decades of research point to a clear connection between alcohol and heart disease. Even moderate drinking can lead to significant changes in normal cardiac function. And when consumed in excessive amounts, alcohol can contribute to the onset of problems that include palpitations, an elevated heart rate, high blood pressure, heart attacks and congestive heart failure. 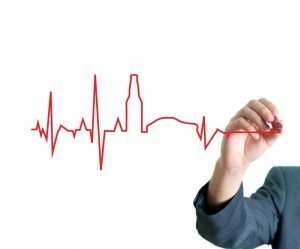 If you or your loved one are concerned that your cardiac health could worsen as a result of excessive drinking, you can help prevent such an outcome by enrolling in suitable inpatient or outpatient alcohol treatment. For more information, call (888)-459-5511 today. Palpitations occur when the heart skips a beat in its normal rhythm or adds an extra beat. People affected by these abnormalities can experience a racing heartbeat. Additional possible symptoms include a fluttering or pounding sensation located in the chest, throat or neck. Most of the time, palpitations are harmless and disappear on their own in a short amount of time. However, they can also indicate the presence of a serious heartbeat irregularity called atrial fibrillation (AF or Afib). In severe cases, atrial fibrillation can also lead to a life-threatening stroke or pulmonary embolism. People who consume just one to three standard servings of hard liquor or wine per day can develop atrial fibrillation accompanied by palpitations and additional symptoms. However, moderate beer consumption does not appear to trigger increased Afib risks. When consumed in excessive amounts, all types of alcohol can contribute to the development of the condition. This pattern of consumption can take the form of binge-drinking or ongoing heavy intake. 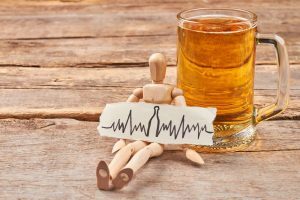 Episodic or chronic heavy drinking can also lead to another type of heartbeat irregularity called ventricular tachycardia. While Afib affects the heart’s upper chambers, this second condition affects the lower chambers. The core symptoms of alcohol-induced ventricular tachycardia mirror the core symptoms of atrial fibrillation. Severe cases of the condition can lead to complete heart stoppage and death. Alcohol is a central nervous system depressant. Among other things, this means that its presence in the bloodstream can slow down the heart. However, the situation is different for people who drink in heavy amounts. This level of consumption can lead to the onset of a specific form of rapid heart rate called atrial or supraventricular tachycardia (SVT). Alcohol-related increases in heart rate can occur temporarily in anyone who takes part in a drinking binge. Doctors sometimes refer to this short-term phenomenon as holiday heart syndrome. Longer-term problems can affect the hearts of chronic heavy drinkers. Blood pressure is a term that describes the amount of force placed on the vessels that carry blood from the heart to various parts of the body. When the heart beats, these vessels experience something called systolic pressure. When the heart rests, they experience something called diastolic pressure. A blood pressure reading combines systolic measurements with diastolic measurements. 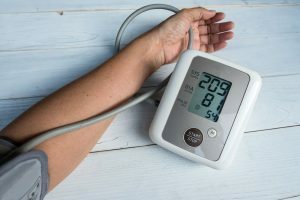 Cases of high blood pressure (also known as hypertension) can occur as a result of high systolic readings, high diastolic readings or a combination of high systolic and diastolic readings. The National Institute on Alcohol Abuse and Alcoholism reports that anyone who binges on alcohol can develop at least a short-term spike in normal blood pressure levels. Longer-term heavy drinking can produce lasting increases. Two factors help explain these realities. First, excessive alcohol intake promotes the release of natural stress hormones that reduce the amount of space inside the body’s blood vessels. In addition, alcohol can narrow blood vessels by activating tiny muscles contained in the vessel walls. Heart attacks occur when an artery blockage disrupts the flow of oxygen-bearing blood to part of the muscle tissue that forms the heart’s main structure. Without the needed blood flow, this tissue will sustain damage, or even die off completely. In severe cases, the resulting change in normal cardiac function can lead to death in a matter of minutes. Every two minutes of the day, roughly three people in the U.S. experience a mild, moderate of the severe heart attack. In a study published in 2017 in the Journal of the American College of Cardiology, a team of American researchers used data from more than 14 million adults to gauge the impact that heavy drinking has on cardiac health. One of the measured impacts was the odds of having a heart attack. The researchers found that excessive alcohol intake increases heart attack risks, even in the absence of any other factors that make an attack more likely to occur. Heart failure is incurable. Even with treatment, it can progress over a period of months or years and produce worsening symptoms. Ultimately, the condition can result in death. Since alcoholism is partly defined by frequent heavy drinking, anyone affected by this disease has a heightened chance of developing some sort of heart problem. However, the same problems can appear in people who don’t qualify for an alcoholism diagnosis. 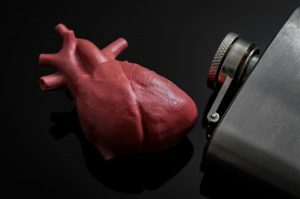 If excessive alcohol use is taking a toll on your cardiac health, you or your loved one can seek help from experienced addiction specialists in an inpatient program, intensive outpatient program or standard outpatient program. Please call (888)-459-5511 today for more information. Addiction Resource » Alcoholism: Everything You Need to Know About the Addiction » Alcohol Effects Guide: Exploring the Long- and Short-Term Effects of Alcohol Use » Alcohol and Heart Disease: What is the Connection?